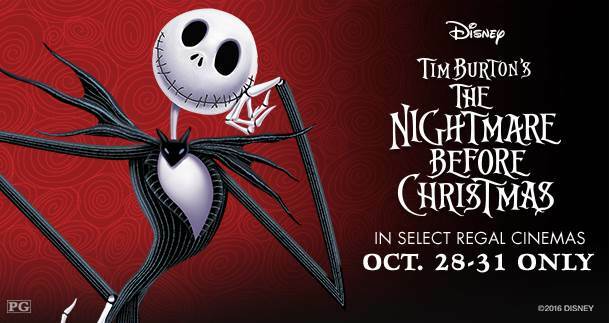 This Halloween weekend, Friday, October 28th – Monday, October 31st, you can celebrate the Halloween holiday with Jack Skellington, Sally, Oogie Boogie and more as Disney’s beloved classic THE NIGHTMARE BEFORE CHRISTMAS returns for a limited engagement exclusively in over 200 Regal cinemas locations nationwide! Tickets are now on sale at select Regal theaters. Participating theaters include locations in Alaska, Arkansas, Arizona, California, Colorado, Delaware, Florida, Georgia, Hawaii, Idaho, Illinois, Indiana, Kansas, Kentucky, Louisiana, Massachusetts, Maryland, Minnesota, Missouri, New Hampshire, New Jersey, New Mexico, Nevada, New York, North Carolina, Ohio, Oklahoma, Oregon, Pennsylvania, South Carolina, Tennessee, Texas, Virginia and Washington. For tickets and information, visit: http://regmovi.es/tnbc2016. We have this movie at home, and think it is a must to see during the Halloween Season! How cool that select theaters are going to have this over Halloween Break! I'll have to look and see if it's showing near us! My grandsons would love to go see this movie in theatres!